I am excited to spotlight Author Abby Vandiver on my new blog today. I am in the midst of reading Bed and Breakfast Bedlam, book one in the Logan Dickerson mysteries, and I am loving it. I will be purchasing the rest. 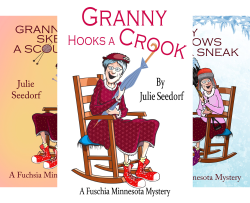 I love funny, quirky characters and Abby’s characters remind me of Granny and Jezabelle in my series of books. Abby is a cozy writer and I would highly recommend her books. What makes her visit exciting is that she is introducing her sixth installment of this series, South Seas Shenanigans. I have to read fast to catch up. Welcome, Abby. It’s the sixth installment of an Amazon #1 Best Selling cozy mystery series by Author Abby Vandiver! South Seas Shenanigans continues the adventures of amateur sleuths, Logan Dickerson, archaeologist, and Vivienne Pennywell, aka, Miss Vivee – a five-foot-nothing, ninety-something Voodoo herbalist. Fans of this series have enjoyed the unusual, rarely heard causes of death that only Miss Vivee and her new husband can recognize, and this one doesn’t disappoint! Sail away on a Fijian paradise vacation with Logan, Miss Vivee and Mac as they suffer the shenanigans of a prankster, dance the Meke, and solve an untimely death. Oh, wait! Did I say “a” death? Make that two! Can you guess whodunit? Additionally, Abby is offering a boxed set of the first three books in the series. Both South Seas Shenanigans and the Logan Dickerson Cozy Mystery Boxed Set are set to be released March 29, 2017. Meanwhile, Abby had only planned to write one more book in the series, but in listening to her fans, she has decided to continue writing the series a little longer. Check out her website for more information. Her debut novel, the mystery/sci-fi, In the Beginning, Book I in the Mars Origin “I” Series was an Amazon #1 bestseller. It was written on a whim, packed away, and rediscovered some twelve years later. After publishing it in 2013, Abby decided to make writing a full-time endeavor. She’s penned a slew of novels since then and has even more in her head. Although she writes mostly mystery, she’s written a historical/women’s fiction novel. It was co-written with author and friend, Kathryn Dionne under the pen name Kathryn Longino. Currently, she is working on her first cozy mystery series. There will be at least five in the series, three, Bed & Breakfast Bedlam, Coastal Cottage Calamity, and Maya Mound Mayhem have already been published and are Amazon international bestsellers. Abby, a former lawyer, and college professor, has a bachelor’s degree in Economics, a master’s in Public Administration, and a Juris Doctor. A lifetime resident of Cleveland, Ohio, Abby spends all of her time writing and enjoying her wonderful grandchildren. Reblogged this on The Cozy Cat Chronicles.